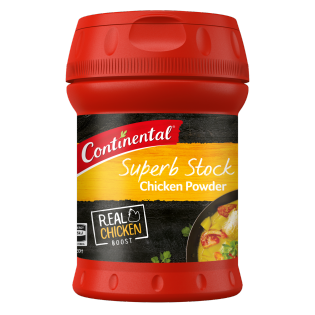 Continental's chicken stock powder is made with real hearty chicken flavours. Learn how to give your meals an authentic aromatic boost here. 1 teaspoon added to 250mL of hot water makes 1 cup of stock. For extra chicken flavour, add chicken stock powder to soups, risottos, casseroles and gravy by either shaking or spooning the desired amount. sometimes i just crave that noodle juice, y'know? but if i open a packet of instant noodles to get some juice, i have to eat the noodles too. Using this, however, i can feast upon all the noodle juice i want, while leaving my precious noodles intact.